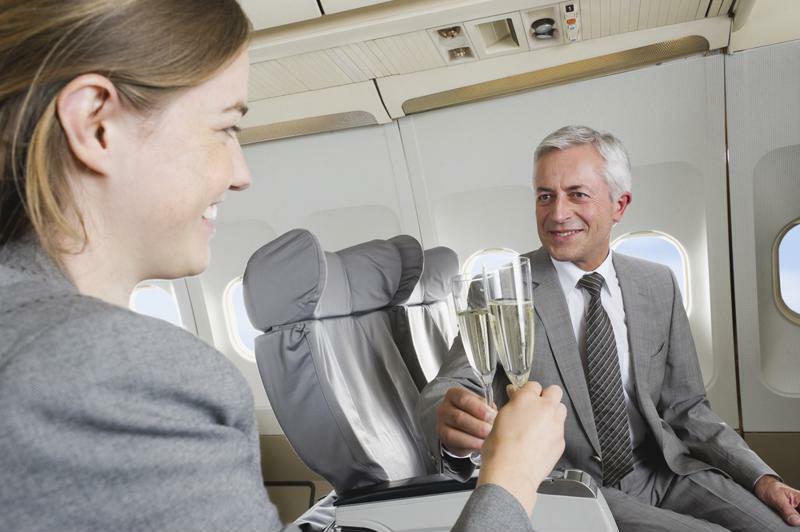 Looking and acting the part is an easy way to experience complimentary upgrades during business travel. The easiest way to get complimentary upgrades for your business travel escapades is by signing up for various reward programs. If you're someone who tends to use the same rental car company, airline or stay at the same hotel, you should most certainly be recognized for your loyalty. Many lodging chains, popular airlines and rental car services offer free sign up for their reward programs, and once you rack up enough miles on the road or through the air, you'll be provided with anything from a first class seating upgrade to even a free plane ticket or car rental. While some of these programs may not provide you with lavish gifts such as in-flight lobster dinners or exotic luxury hotel suites, they often allow members little advantages, such as not having to wait in a check-in line or instant alerts on free rooms or seating upgrades. It's definitely worth checking into a few reward programs if you're constantly traveling for work. You never know when a rewards program can bump you up to first class. Y = Full fare economy class ticket. J = Full fare business class ticket. F = Full fare first class ticket. Knowing what your class is can actually come in handy when it comes to scoring last-minute seating upgrades or discounted fares before your flight takes off. If you book a ticket for an economy class seat at full price, make sure you go with a Y or B booking code. This way, you can check a day or two before your flight is scheduled for departure to see if there are any eligible upgrades. Frequent fliers who book tickets with these codes can receive complimentary upgrades or discounts if there are still open seats available on the flight. While keeping track of codes can be tricky, coordinating with a travel agent regarding booking code upgrades may help elevate your status without having to work for it! "Giving up your seat can result in huge flight upgrades." Airlines run into all sorts of chaos when it comes to booking tickets. If you're constantly flying for business travel, you've more than likely witnessed an airline representative desperately trying to see if someone will give up his or her seat in order to help out another passenger in need. While most travelers obviously want to avoid any delays or headaches as much as possible, if you have some time to spare, take an airline up on this opportunity. More often than not, giving up your seat on a flight can result in everything from a free ticket to complimentary first class upgrades or even added miles. Airlines take these acts of kindness seriously, and in return, your gratitude and compliance will be rewarded. Whenever you come across a scenario in which economy seating is overbooked or all the budget rooms are reserved, you want to present yourself in the most professional way possible to get yourself out of a tricky situation. If you're dressed to impress and treating the front desk person with complete respect, they'll certainly feel more inclined to hook you up with an upgrade to make up for any inconvenience. Looking and acting the part can potentially result in providing you with a first class seat instead of flying coach at no additional charge, or a complimentary room upgrade on a busy night at the hotel. A suit and a smile can also go a long way when casually asking the front desk if there's any possible way you could upgrade to a better room. If business is slow, you never know what sort of perk you could wind up walking away with.